In 1975, R.C.A. Records released Lou Reed's seventh album following his departure from the Velvet Underground five years earlier. The album was a two-record set titled Metal Machine Music and was met with much derision from the record-buying public, who went back to their respective record stores in droves and demanded refunds, claiming the album was "defective." About a year ago , an English record company called Great Expectations re-released Metal Machine Music. While the album has been back on record store shelves for a year or so now, I have not yet seen any reviews regarding the re-released version, so I've decided to review it myself. Along with Igor Stravinsky's La Sacre du Printemps (The Rite of Spring), which caused a riot at its 1913 debut, Metal Machine Music is one of a handful of compositions to elicit an almost universally negative response from the public. The Trouser Press Record Guide, in its entry for Lou Reed, describes Metal Machine Music as "four sides of unlistenable white noise (a description, not a value judgment) that angered and disappointed all but the most devout Reed fans." The Worst Rock 'n Roll Records of All Time by J. Guterman and O. O'Donnell lists Metal Machine Music as the second-worst album ever made (with the #1 spot going to Fun With Elvis On Stage). 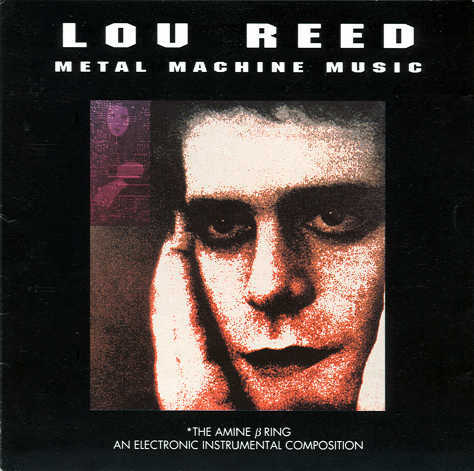 Some have suggested that Metal Machine Music consists of nothing more than the results of Lou Reed setting up microphones in front of some loudspeakers, letting the feedback build up to an intense howl, turning on the tape machine, and then leaving the studio. Considering the album's infamy, what on earth could have prompted Great Expectations into re-issuing it? And what could have prompted me into shelling out $22.00 for the compact disc version of said re-issue? Well, Great Expectations must have known that somebody would enjoy this --- I enjoy it, although it has taken me most of a year after buying Metal Machine Music to come to this realization. Admittedly, I can't see too many other people getting into this, but on the other hand, I would not call this "unlistenable white noise." Nor do I agree with the aforementioned suggestion of how the album was made. Yes, there is intense feedback, and if one believes the liner notes' statement that the recording involved "no instruments," then it could, indeed, be a recording of microphones set up directly in front of the amplifiers that they are plugged into. But the idea that Lou Reed then left the studio is false --- or, at the very least, if Lou Reed did leave, then somebody stuck around --- because there is a lot happening on this album. It sounds like Lou took some basic recordings of feedback and subjected them to all sorts of electronic manipulation --- the "Specifications" section of the liner notes lists an Arbiter distorter ("Jimi's"), Fender and Sunn tremolo units, a ring modulator, an octave relay jump, and a reverb unit. This is probably the basis for the heavily distorted drones which dominate much of the album. The drones shift every so often, and in fact, seem to be harmonically related (for the most part); the Specifications actually note the "avoidance of any type of atonality" (which some will find very hard to believe). On top of these drones, one hears short, intermittent rhythmic pulses (perhaps the aforementioned tremolo unit), occasional high-pitched squeals (sometimes resembling the cries of a medium-sized rodent), and very rapid successions of actual notes --- too rapid to be discernible, but in an interview with Lester Bangs, Lou Reed claims to have inserted "symphonic rip-offs in there, running all though it... but they go like --- bap! in five seconds." He then mentions Beethoven, Mozart, The Glass Harp, Eroica, etc. I imagine that he's referring to these rapid series of notes. All of this is spliced up into an actual composition, with certain "motifs" that come and go every so often. If my account of Metal Machine Music isn't descriptive enough, I can actually think of a few reference points. One of these, which predates Metal Machine Music by several years, is "E.X.P.," the first song on Axis: Bold as Love by Jimi Hendrix. "E.X.P." is somewhat similar to Metal Machine Music, if you played, say, 8 or 9 tapes of it simultaneously but at different speeds. A more recent work which is similar to Metal Machine Music is From Here to Infinity, a 1987 mini-album by Sonic Youth guitarist Lee Ranaldo (Sonic Youth, in fact, used a small snippet of Metal Machine Music on Bad Moon Rising; it's the repetitive sound during the fades into and out of "Society is a Hole"). Now that you have some idea of what Metal Machine Music sounds like, you may still be wondering how or why anyone could or would listen to it. I like it, and I couldn't even tell you exactly why. I thought about a notorious psychological experiment in which a dog was confined to a small chamber that was divided in half by a low partition. The floor in each half of the chamber was capable of emitting an electrical charge. When the dog felt a shock, it would let out a little yelp and leap over the partition to the other half --- at which point the floor in that half would be activated, causing the dog to jump back over the partition. After a while, the experimenters would turn on both halves of the floor simultaneously. And eventually, the dog would just sort of sit there, no matter what happened, long after having given up on jumping to the other side or at least whimpering. In other words, as Harry Dean Stanton put it in the film Twister [a film from ca. 1990, not the more recent blockbuster]: "I suppose you can acquire a taste for anything, but why do it?" Or something like that. While it's true that, for me, Metal Machine Music is an acquired taste, requiring a certain amount of patience at first, I don't think that the phenomenon from the experiment which I've described is at work here --- after all, I could have simply turned off the C.D. player, taken the disc out and either (1) thrown it across the room, (2) sold it to a record store that buys used discs (as if they would buy it) or (3) done like the folks did in 1975 and tried to get a refund. But I didn't --- I really do like this. It's like listening to a new idea every three seconds (or less). I think the only reason it took me a year to really get into this is because I just assumed I couldn't stand the full 64 minutes of it. Actually, I never disliked it --- I was always able to listen to several minutes at a time without any trouble. It's also a good source of material if you're interested in doing audio tape experiments (a la "Revolution #9" by The Beatles): after I learned how to splice tape in a radio production class, I spent most of a night splicing this up with synthesizer drones and an old recording, played back through a distortion unit, of a friend and myself jamming on guitar and bass in my parents' garage (I never did finish this experiment...). When I bought Metal Machine Music, I knew there was a possibility that I wouldn't like it (but only because of what I had already read about it, which were, after all, simply opinions anyway). But after reading about the damn album for years, I knew that I had to at least hear it. And luckily, as it turns out, I enjoy it. Like I've said, most people will never tolerate this for more than a couple of minutes, much less actually like it. I'm willing to bet that at least one person has been beat to a pulp, thrown in jail, evicted, or placed in an "adolescent center" for playing Metal Machine Music too loudly --- that is, loud enough so that someone else overheard it. But I do believe that there are people who will enjoy this album. There doesn't seem to be much middle ground with Metal Machine Music (although I did just "sort of" like it until recently). Either someone will be utterly repulsed by this after five minutes at the most, or s/he will become almost or totally hypnotized (I am not --- I repeat, not shitting you when I tell you that I felt like I was on the verge of hallucinating while I was listening to this the other night --- Like watching a dreamachine. Or the very early stages of a lysergic experience: that heightened, somewhat paranoid sense of weirdness). ©1992, 1996 by Joe Castleman.